At The Cottages, we strive to provide the very best care to our residents. To that end, education and training for our staff is essential. When we opened our new building in Round Rock in 2011, we began the TULIPS Parkinson’s certification training for our staff. 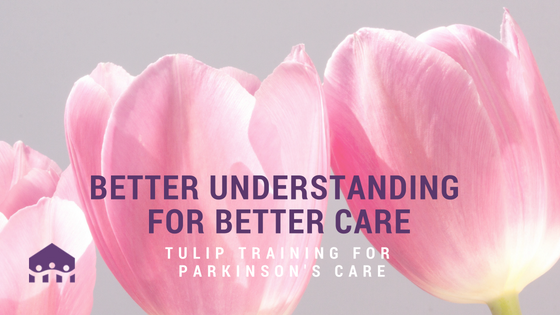 The TULIPS certification — Time, Understanding, Live Quality, Increased Awareness, Pills on Time and Support — assures our families that our staff have a better understanding of Parkinson’s Disease, and are able to provide the best care for their loved ones. Parkinson’s Disease is a chronic, progressive degenerative disease of the central nervous system. Second to Alzheimer’s, it is the most common neurodegenerative disease in America. Most Americans living with Parkinson’s are 60-years-old or older and risk increases with age, though early onset of the disease (40 years or younger) occurs in five to 10 percent of Parkinson’s patients. Parkinson’s is also related to dementia in that, according to the Alzheimer’s Association, an estimated 50 to 80 percent of those with Parkinson’s Disease eventually experience dementia as their disease progresses. The average time from onset of Parkinson’s to the development of dementia is about 10 years. Each year, The Cottages works with a home health agency to provide TULIPS training to staff who have not already received their certification. It is a one-hour inservice for staff and includes a test upon completion. The training covers basic knowledge of the disease, including risk factors and symptoms, sleep changes and pain control and how to assist people living with Parkinson’s with daily care needs, such as getting in and out of bed. Better understanding means better care, and we believe the TULIPS certification provides our staff with the knowledge and tools necessary to provide the top-notch care for our residents and peace of mind for their loved ones. If your loved one is living with Parkinson’s disease and dementia, contact us today to learn more about the state-of-the-art care we can provide at The Cottages.